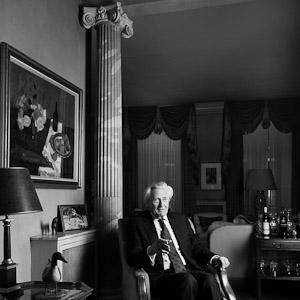 Michael Ray Dibdin Heseltine was born in Swansea on 21 March 1933. He was educated at Shewsbury School and Pembroke College, Oxford. At 18 he joined the Conservative party. He married Anne Harding Williams in 1962. After leaving Oxford, Hesletine became a commissioned officer in the Welsh Guards. He afterwards pursued a career in the media, becoming a television interviewer from 1960 to 1964 and the chairman of the Haymarket Press in 1964. In his path to Parliament he unsuccessfully contested Gower in 1959 and Coventry North in 1964. He was elected at Tavistock in 1966, which he held until 1974 when he was elected for Henley. He retained the seat until he was made a life peer as Baron Heseltine of Thenford in 2001. After his first year in the House he joined the front bench. He served in the Department of Transport, as Junior Minister at the Department of Environment and as Minister for Aerospace and Shipping. In opposition he was spokesman on Industry (1974-76) and the environment (1976-79). When the Conservatives returned to government he became the Secretary of State for the Environment (1979-83) and for Defence (1983-86), resigning from the latter post as a result of the Westland affair, and subsequently challenging Margaret Thatcher to a contest for the leadership of the Conservative Party which led to her resignation in 1990. Under John Major, he returned to the cabinet as Secretary of State for the Environment (1990-92), President of the Board of Trade, and between 1995 and 1997 First Secretary of State and Deputy Prime Minister. [On entering Parliament for the first time] "Talk of the new boy at school. … I’d been a new boy at school time and again, and I remember the loneliness, you’re there, suddenly your parents have gone, the friendly teacher or whoever it is, who said now you’ll be alright, there you are in a room, alone, What do I do? Usually, someone tells you what to do. There’s a bell for tea, there’s prep, there’s a sports game, whatever it is, something, somebody tells you what to do. But in Parliament – I remember vividly – you arrive and there you are, you’re on your own. So fine, after all, you’ve been elected, you’re a mature person, you’ve got to find your way, but I do remember the sense of, golly, what do I do now? Because it’s up to you. There’s no training path, there’s no induction course, you’re on your own."